William Shakespeare famously declared that “past is prologue,” and the bard’s words ought to give us pause as we assess the first scene of this very strange play in which we now find ourselves as a nation. If the first hundred days of Donald Trump’s presidency form the prologue for what is to follow, I fear for what might transpire in the months ahead. In just a short time, the actions — and often inaction — of this Administration have strained the very seams of our democracy and laid the groundwork for a presidency characterized by chaos, confrontation, contradictions, and broken campaign promises. On the campaign trail, Donald Trump told voters that he would be the “greatest jobs-president God ever created.” He also pledged to present Congress with a $1 trillion investment package for infrastructure to grow our economy and put more Americans back to work. However, Congress has received no plan for jobs from this White House, and the only jobs President Trump wants to talk about these days are ones he claims credit for creating, even though they were announced months or years before he took office. Nor has the Trump Administration put forward any proposals to invest in infrastructure. In fact, the budget outline he released in March seeks to cut Department of Transportation programs by 13%. He pledged in his “Contract with the American Voter” to label China a currency manipulator and pass legislation to end offshoring in his first hundred days. It took him fewer days than that to break this promise after meeting with the Chinese president, and still there is no offshoring legislation to be seen. Donald Trump promised “insurance for everybody” that would be “much less expensive and much better” than what Americans have under the current system with the Affordable Care Act. But the health care plan that he and House Republican leaders introduced would kick 24 million people off their coverage and force millions to pay more for less. TrumpCare would also allow insurers to discriminate against Americans with pre-existing conditions once again, and it would impose an “age tax” on older Americans. Instead of working with Democrats to promote greater certainty and stabilize our health insurance markets, the President and his Republican allies have been actively undermining them by sowing uncertainty and instability. Promising that Americans’ safety would be “restored” starting from his first day in office and that his policies would “make America safe again,” President Trump has instead taken actions that are making our country less safe. From proposing to cut the budgets of the State Department and USAID by 29% to his unconstitutional attempts at a Muslim ban, which alienates key allies, he has weakened America’s defenses and eroded the global leadership that makes us strong. Contrary to his promise that he would ask his generals to present a plan to defeat ISIS within the first thirty days, no strategy has been articulated. Embarrassing national security blunders have called into question his ability to deter our adversaries, including statements that the administration was “putting Iran on notice” with no strategy to back it up and announcing the deployment of a carrier group to the vicinity of North Korea when it was, in fact, headed in the opposite direction. A hundred days into his presidency, Donald Trump is already on his second national security advisor while he continues to dodge serious questions about his soft stance on Russian aggression and refuses to hold Vladimir Putin accountable for interfering in our election. On seemingly every issue, Trump’s promises have rung hollow. Having said he would “drain the swamp” of alleged corruption in Washington, he has promoted one of his real estate properties using government resources, won’t make the White House Visitor Log public, and refuses to release his tax returns, which would shed light on possible conflicts of interest. The middle class tax relief he included in his “Contract?” On Wednesday, he unveiled a one-page proposal for massive tax giveaways to a handful of the wealthiest individuals, all paid for by our middle class with trillions more in debt. And that “big, beautiful” wall along our southern border that security experts say would not make us any safer? Now, Donald Trump is proposing that American taxpayers foot the bill, not Mexico. AFTER 100 DAYS, WHAT’S NEXT? 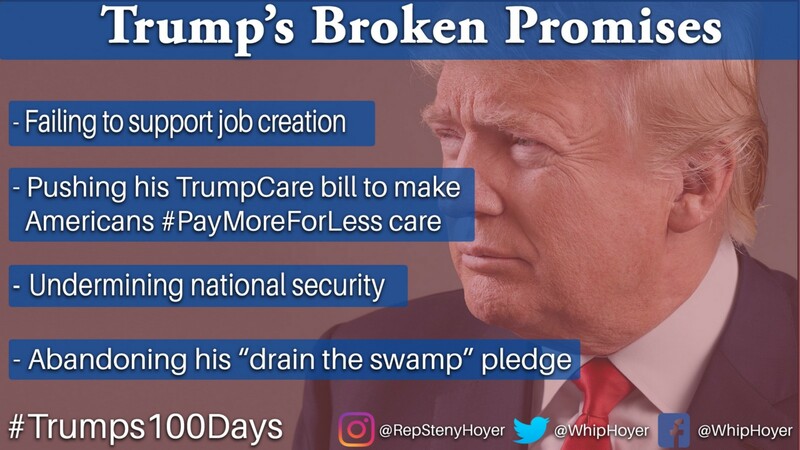 These past hundred days have raised serious concerns about Donald Trump’s ability to govern in a way that makes America stronger and helps Americans get ahead. America is a great and a good nation, home to an exceptional people who defeated fascism and communism, fought for civil rights, and went to the moon. We must not, by demagoguery, irrationality, or ‘alternative facts,’ launched on the wings of a tweet, allow this great nation to be brought low. It is to that work that we ought to dedicate ourselves in the next hundred days and beyond.